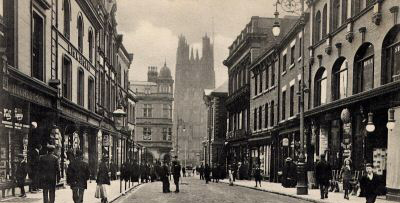 In 1923 the Police officers in 'A Division' (Wrexham) Denbighshire Police set up a charitable fund to assist the poor and needy in the Wrexham area. Donations were sought from wealthy and professional people in Wrexham and also from weekly subscriptions from the officers themselves and members of the public. The Police officers took part in organized charity events; the first such event was recorded in the minutes and consisted of a comedy football match between the Wrexham Police and the Walter Roberts Pantomime company which took place on May 19th 1924. The sum of £104 8s was raised. During the whole of 1924 the total raised from this and other events such as whist drives and a Police/Public Dance was £230 6s 3d. Donations in the first full year of the charity were made to families in dire straights, to the poor box at Bromfield court, the Wrexham infirmary and to the Hippodrome Theatre to provide a Christmas treat for youngsters. The balance remaining from the first year was £139 16s 6d. The following year brought regular donations from all large and well-known wealthy families in the Wrexham area. Local business and professional people made regular contributions to the charity. It soon became apparent that that there were sufficient charitable people in Wrexham and the surrounding area to assist the fund, and the secretary would send 'begging' letters on behalf of the fund seeking these donations How the fund operated was the subject of an article in the Wrexham leader on 21st February 1925, which gave an insight into the Police activities. It concerned how a patrolling constable on his beat, sleeping rough in an outhouse on a freezing cold night, found a man and woman together with their children. They were taken to the county buildings 'lockup' and given food and shelter for the night and eventually provided with rooms where they could reside together with bedding and food to tide them over, all provided for by the Police of Wrexham A division. 17.2.31: Five shillings [25p] worth of groceries per week for four weeks. A pair of boots for two children up to the sum of £3 for an unemployed Rhostyllen miner. Case submitted by PC 90 (Bill) Roberts - case resolved to grant 16 shillings towards the cost of one month's maintenance at the Royal Alexandra Home Rhyl, for a boy aged 11 years the son of an unemployed miner from Kings Mills. It was an accepted practice to appoint a constable to visit each school in the Wrexham area to assess, with the help of the teachers, which children required boots and clothing for Christmas; tenders were requested from Wrexham Boot companies and milliners. Sizes 7-10 @ Five shillings ten pence per pair. Sizes 11-1 @ Six shillings eight pence per pair. Sizes 2 -3 @ Seven shillings one pence per pair. The boots were then purchased for both boys and girls and distributed at the following schools in Wrexham and the surrounding areas. An application for Acton school was not made until 1931. Every year between 1923-39 in excess of 500 children received boots from this fund. All applications for food clothing and financial help from individual families were made on a regular basis, but where it was seen that previous requests had been made these were usually refused. In 1934 it was proposed that in view of the Gresford mining disaster no begging letters be sent out. A notice was inserted in the press and an explanation made as why the usual appeal had not been made. The main source of funds continued to be the Police officers themselves and each year a charity dance was held for all to attend. Tenders were invited from Bands and in 1938 a tender from Al Morris from Rhostyllen to provide a dance band of ten players for £6 6s all inclusive was accepted, with the comment that he be asked to provide a microphone. Whist drives and other fund raising activities also continued throughout each year. With the advent of the war years and full employment applications for aid decreased and the fund's activities grew less. At an extraordinary meeting of the Police aided charity in 1966 it was proposed that with the commencement of the National assistance act of 1948 there had been lees need for a fund of this kind. Donations had not been sought for a number of years and the Deputy chief constable of the Denbighshire Police, Chief Superintendent D. Stan Jones, proposed that the fund be dissolved. An amendment to retain the fund was made by Detective Charles Mathews was lost for lack of a seconder. It was therefore proposed that that any remaining monies be divided between Wrexham bodies responsible for maintaining similar funds - The Mayor's Charity and The Civic Guild of Help. The fund closed on the 22nd March 1966. It had helped the poor in Wrexham for 43 years. The minute book for this charity has been lodged at the archives in Hawarden.